He's beginning to doubt your commitment to Sparkle Motion. When the state of universe is thrown into chaos, Thor sets out to protect Earth and beyond. One of the best things about Hasbro's endlessly excellent run on Marvel Legends is that we've seen them take shots at doing multiple versions of beloved characters, often across different costumes and films. A notable update here is Thor as seen from the end of Ragnarok onwards, with an entirely different look, then an all-new weapon crafted in the Infinity War storyline. An update of the God of Thunder was just what the doctor ordered, and he makes an excellent addition to the Cull Obsidian Build-A-Figure series. 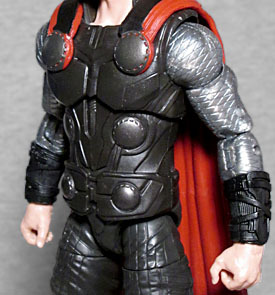 Chris Hemsworth has appeared in the Marvel Legends line several times to varying degrees of success, and this is unfortunately not the best sculpt we've seen of him. He's a little bit too chubby on the face, his features aren't quite right. Despite the fact that this is the same mold they just used for Ragnarok, and it seemed normal there? Fortunately, his size is apt; he stands a mighty 7" tall, a good scale alongside the human characters in this series, and he's still quite recognizable as Thor. The mediocre sculpt is given a good paint job, with all of the appropriate detail on the hair, costume and face, including the scar over the right eye. 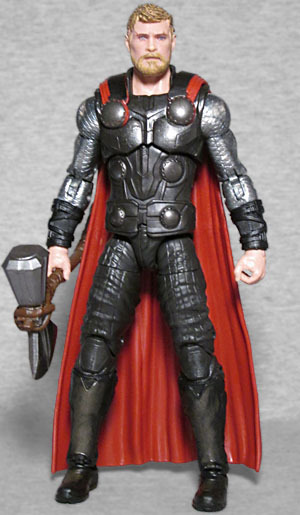 Although I prefer the Black Widow sculpt, the paint on Thor's hair is much improved over her noodle blonde cut. Additionally, good detail has been applied to the different shades of black and metals all over his sculpt, and the red cape hangs very nicely. Thor's got all of the articulation you'd want, with balljointed neck, rotating hinge shoulders, double pinned elbows and knees, hinged wrists and ankles, swivels at the top of the legs and arms, the works. He's got plenty of poses, especially with his two terrific accessories: his brand new Stormbreaker axe; and one of my fav things, a lightning effect which wraps around the weapon! I love stuff like this, it goes above and beyond to make a toy all the more dynamic. 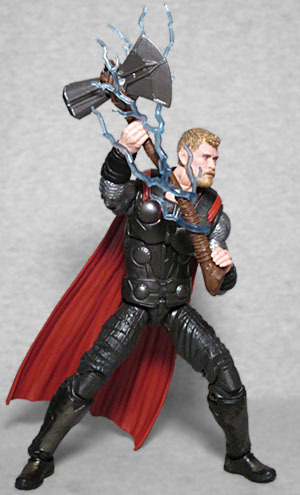 Stormbreaker can be wielded single-handed or in two hands, thanks to its extra-long, rough-hewn handle. You could even say it's... hand-made? Hand-Made, Coral! The icing on the cake here is that Thor includes a massive part of the massive series Build-a-Figure, massive Cull Obsidian's massive left arm! So it's win-win; if you want a great update of the Marvel Cinematic Universe Thor to fight in your on-shelf Infinity War you're getting a great toy; if not, despite the slightly softer face sculpt, you're going to want to nab this big durable guy just to finish off Cull Obsidian. Hasbro, keep doing what you're doing! !